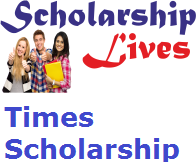 A golden opportunity is available for young and brilliant hardworking candidates of India who pursing 12th class they can apply online for Times Scholarship 2019 via the official website of the department. If you are also one of the eligible candidates then check the complete eligibility criteria here and fill timesscholars.com Test Application Form accurately through the link which is mention at bottom of the page. The main aim of the department behind the Times Scholarship test is to find out the young talented diamonds from India and intelligence the power of India in the whole world to get more tallness . All interested and talented contenders may submit the Times Scholarship Application Form before the last date which will be soon updated here. According to last year experience, the registration process will soon start. Applicant’s documents will also be attested by the present Institute/college principal. Applying Guardians income must be less than 2 lakh. The photo should also be attested. Log in the official website of the department “www.timesscholars.com”. The read all the information about the scholarship. Then find the registration link. Upload the all required documents, photo and signature. Check the whole information and then submit it. Finally take print out for futures use.